I deviated from the original plan since the last post and decided against doing a primer coat before I do the interior. 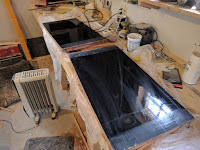 I did get a good chunk of the weave filled with 2 coats of unthickened epoxy and glassed the transom. I think it's looking pretty good now, but time to move on. Instead of priming, I decided that it would be best to get the interior fitted before I tried making the hull look any prettier, so I marked and cut out the daggerboard slot and this is where I am basically throwing away the plans. 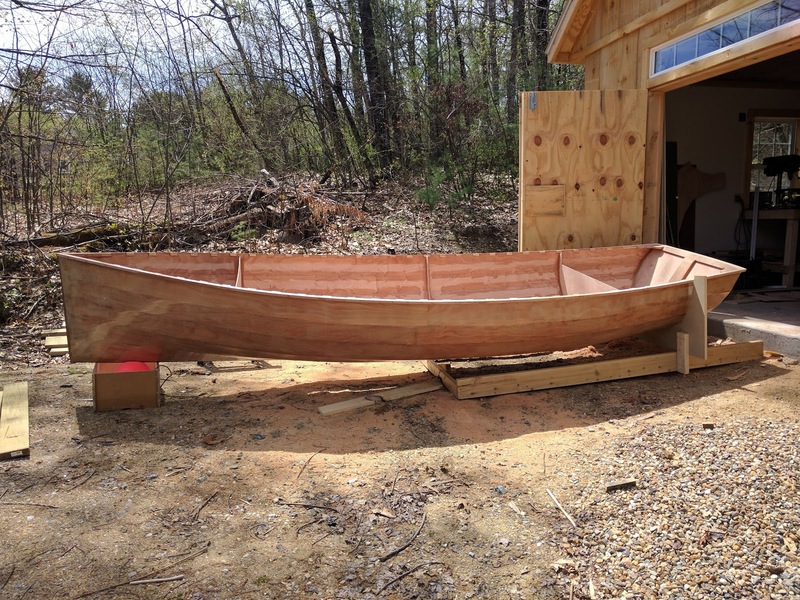 I plan on a number of modifications to the interior, including the daggerboard. 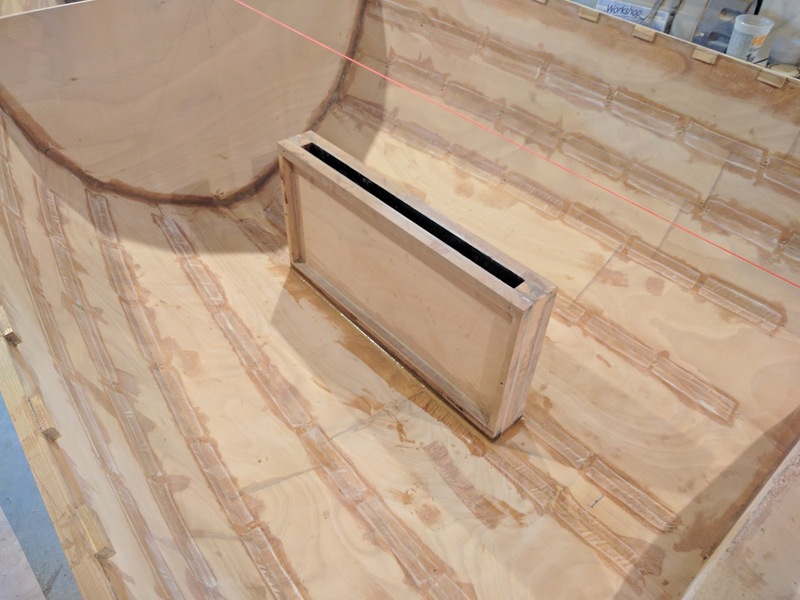 The plan calls for a 25 mm wide daggerboard with a long slot (basically about the same size as a centerboard trunk. I talked to the designer about this and I decided that in order to optimize space, I would shorten the trunk because I only plan on building the standard rig, and not the light air rig which requires setting the daggerboard further back. Additionally, I'm planning on building a NACA0012 foil for the daggerboard and if I keep the chord of the daggerboard at 280 mm, that means that the maximum width of the daggerboard is 33 mm, not the 25 mm as designed. I won't go into much detail now, but in a nutshell, but NACA stands for National Advisory Committee for Aeronautics and the 0012 designation means that the maximum width of the foil is at 12 percent of the chord. In other words, it will look a bit like a wing. In theory this should allow the boat to point a bit higher before stalling. I think it will be fun to build. More on that when I get to it. 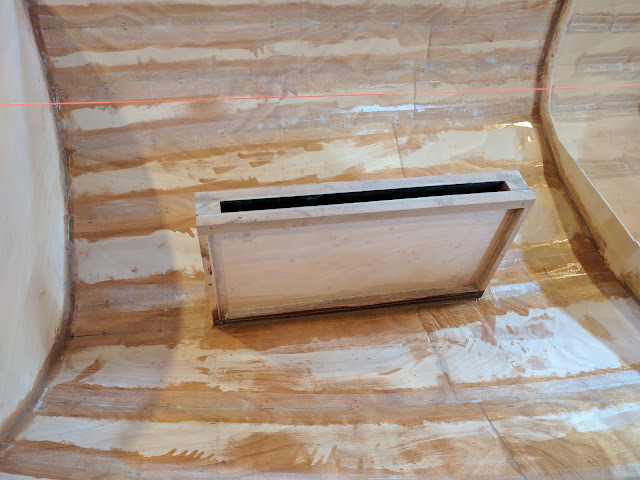 My son and I moved the boat outside and we flipped it over so I could sand the 50 mm tape in the interior to prep for applying the 75 mm tape over that. Using 80 grit sanding disks on my 5" random orbit sander I was able to get everything acceptably smooth in about 2 hours. I vacuumed it out and we moved it back in. I measured and cut enough 75 mm tape to cover all the 50 mm tape in the bow and mid sections of the boat. I'll do the aft section a little later, but for now I want to focus on the centerboard trunk and the mast step and forward assemblies. Using 6 oz. batches of epoxy, I painted out all the 50 mm tape seams and then lay the 75 mm tape in it before moving on to the next. After a few of these 4 - 5 foot sections, I'd circle back and make sure the previously laid sections were fully wetted out. I always miss a few spots on the first pass so it's good to go back over them with a brush and squeegee. Once I finished up I moved onto the daggerboard trunk and let the new tape cure. Make sure your daggerboard will fit. Install it in the correct location (Center of Effort +/- lead). Make sure it is built stout enough to take a beating (because it will). The trunk has to spead the loads imposed on it to the boat without introducing major stress risers. So to start, I had previously determined with the help of the designer a shorter length daggerboard trunk and located it on the boat (fore and aft). From there, I scribed the bottom curve onto a piece of scrap and transferred it to the 6 mm marine plywood I planned on using for the sides of the case. I cut each side of the case out to the proper dimensions and then epoxied what would become the inside of the trunk with 6 oz cloth. Once that had kicked, I followed up with a coat of unthickened epoxy with 10% graphite powder mixed in. I let it kick again and repeated with another graphite coating. The thought behind the graphite is that it is a good 'lubricant' and provides a slicker surface for sliding the daggerboard. I think there is plenty of debate on whether it works or not, but hey, it looks cool. I let everything cure up for a day or so and then sanded the sides where the mahogany spacers would be screwed and epoxied into place to maintain the 35 mm desired width (for the 33 mm wide board). 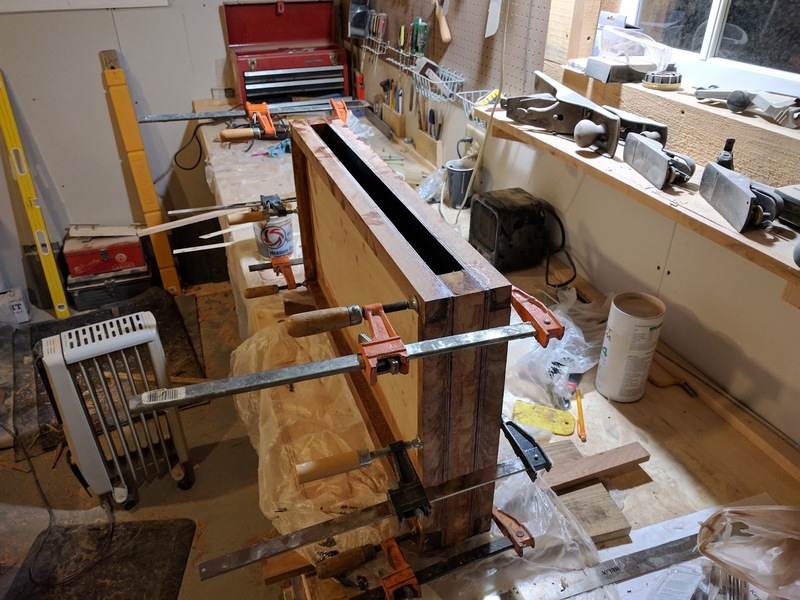 I clamped it all together and called it a day. The next day I epoxied on some bed logs (scribed to the curve of the hull), which didn't seem to be part of the original plan, but I think they are crucial for stiffening up the trunk. I also added top pieces that will be covered by a trim board once completed. At this point I was about done, so I cleaned things up a bit with a heat gun to get rid of the inevitable gobs that I missed when the epoxy was still wet and sanded and rounded the inside corners. I fitted the board the next day and to my amazement, it all fit without a single hiccup. 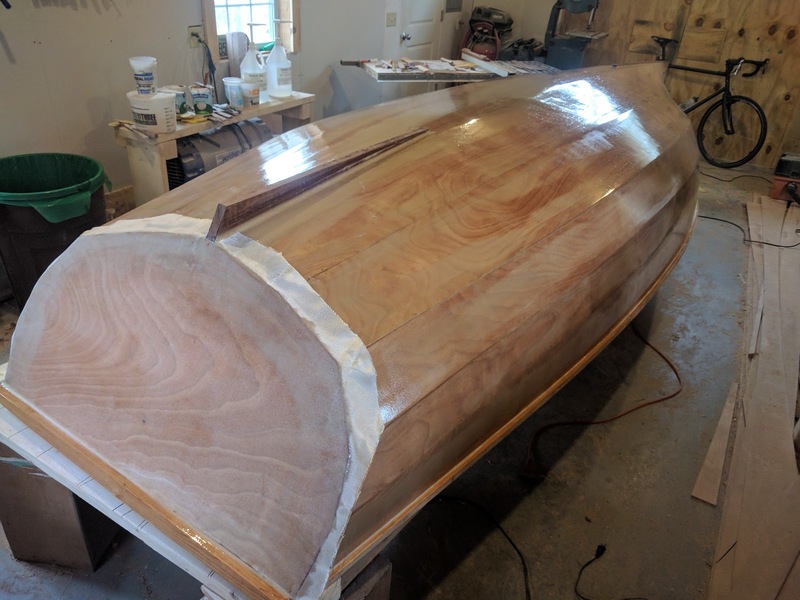 I epoxied it to the hull with some thickened epoxy, and made a nice filet along the port and starboard edges before laying down a 75 mm wide strip of cloth to really tie it in. 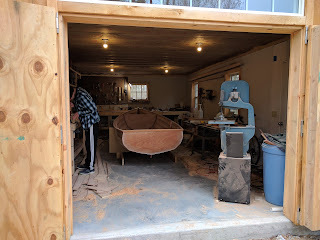 Of course there will be frames fore and aft and a vertical stiffener about midway that will further tie it into the boat, but this was a good milestone.